Miss Berry thanks Mrs. Milton for her letter and thanks her for the rugs to copy which will be sent to her daughter once they are finished in the weaving room. Miss Berry also asks for Mrs. Milton to visit once she is strong enough and when the cotton fields are white. 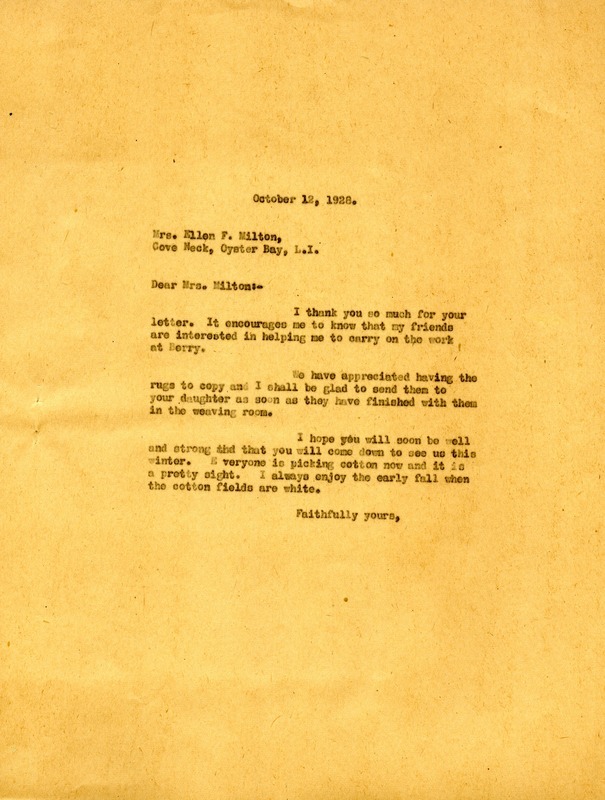 Martha Berry, “Letter to Ellen Fink Milton from Martha Berry.” Martha Berry Digital Archive. Eds. Schlitz, Stephanie A., Sherre Harrington, Meg Ratliff, et al. Mount Berry: Berry College, 2012. accessed April 24, 2019, https://mbda.berry.edu/items/show/8428.